Social media-savvy residents and commuters are being urged to sign up for Warrington Borough Council’s swing bridge e-alerts. 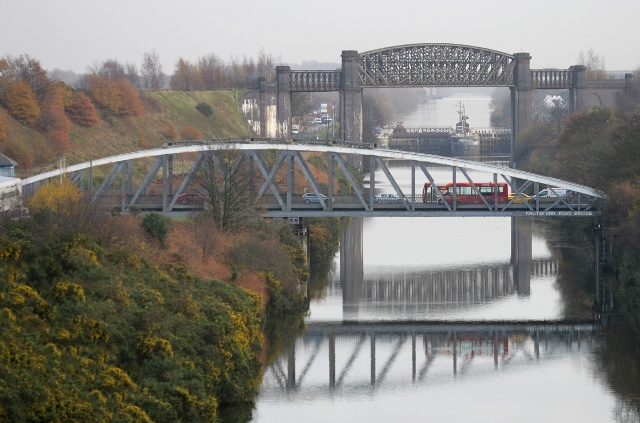 Warrington has three swing bridges which cross the Manchester Ship Canal on the A5060 Chester Road, the A49 London Road and the A50 Knutsford Road. Delays of up to 16 minutes can occur when canal traffic passes through. Cllr Hans Mundry, executive board member for highways, transportation and public realm, said: “Improving congestion caused by the swing bridges is a priority for us and we are committed to making it easier to get about Warrington. “Local residents and commuters can receive the latest updates to their phone and receive warnings of when the bridges are due to swing via email and our dedicated social media pages. Swing bridge e-alerts are available on Twitter at @trafficwarr and Facebook at facebook.com/trafficwarrington. Warnings are posted to social media accounts at least 25 minutes before the swing bridges are due to open. Drivers should also look out for warning signs on the roads leading towards the swing bridges which light up and indicate that the bridge is opening and to expect a delay of around 12-16 minutes. As well as access to regular social media messages, residents also have the option to receive updates by email. More information is available at warrington.gov.uk/register.